Description: An EMD SD40-2 heads an eastbound freight stopping at Abrams Yard in October 1978. Description: CR U28C 6828 (ex-6528) at Selkirk in August, 1979. 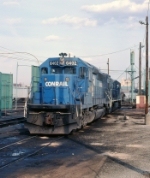 Description: Conrail SD40-2 with a Mopac U30C at the long-gone Mopac diesel shop off of Choteau Ave. Date of photo approximate. 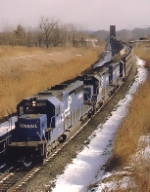 Description: OIBU works the middle yard at Binghamton with a pair of SDs, as is typical for the train. Note the NYSW RS 1 in the dead line at left.